Coconut Chia Oat Squares are a versatile little addition to your breakfast menu. Add them to yogurt bowls, pair them with milk and fruit, or make a little parfait in a glass mason jar for breakfast on the go. Packed with chia seeds and almond butter they will give both you and the little ones a good start to the day. Way better than store bought cereal. I received a copy of this book for review. No compensation was provided. This post includes affiliate links, and I will earn a commission if you purchase through these links. Please note that I’ve linked to these products purely because I recommend them and they are from companies I trust. I managed to snag a copy of the newest edition of the Better Homes and Gardens New Cook Book before it hit the stores. I have been cooking from this thing all week, and let me just say it definitely has something for everyone. Think global flavors, fresh ingredients and the answer to pretty much every cooking question you could possibly come up with. What’s New in the New Version? Each page is now filled with how-to photos and helpful guidance, making it the perfect cookbook for beginner and advanced cooks alike. There are also a lot more recipes reflecting what we are eating today. From sheet-pan dinners to grain bowls, center-of-the-plate veggie meals to gluten-free cookies. The BIG promise remains the same though: You will have success in the kitchen! And after making a chili, a noodle bowl, breakfast eggs and these chia oat squares with success each time, I can vouch for that. 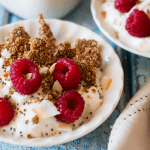 Breakfast is probably the one meal of the day where I feel like we can really get stuck in a rut, so I hit the breakfast section first, and just loved this Coconut Chia Oat Squares recipe. I made a double batch and stored in glass mason jars in the fridge and we have been adding to our yogurt bowls and smoothies all week. I cut some into slightly larger squares and the kids have been eating them as cookies/oat bars. What Do We Include in There and How Do I Store Coconut Chia Breakfast Oat Squares? Fiber-rich chia seeds. They add texture and heart-healthy, plant-based omega-3 fatty acids. To store, just pop them into a glass mason jar and store in the fridge. I have never had mine for more than a week because the kids like to add them to everything, but I am sure they would be fine for 2-3 weeks if kept airtight when not being used. Happy eating. Preheat oven to 325F. Coat a 15x10 inch baking pan with cooking spray. In a food processor combine next 5 ingredients (through flour). Cover and process until finely ground. Add next 6 ingredients (through coconut extract). Cover and process until combined. Transfer to a large bowl. Stir in chia seeds (mixture will be crumbly). Using the bottom of a measuring cup, press oat mixture firmly into prepared baking pan. Bake 18-20 minutes, or until golden. Cool in a pan on a wire rack (mixture will crisp as it cools). Using a table knife or small metal spatula, release oat mixture from pan. Break into small bite-size pieces. Store at room temperature up to 1 week. If desired, serve with milk and fruit. I would absolutely love these coconut chia breakfast oat squares with a bowl of greek yogurt and fruit for breakfast! So satisfying and they sound so easy to make. I’ll have to get a copy of the new Better Homes and Gardens cookbook for my collection! They always have great recipes. I have to get some chia seeds!! These little bites look so good and they’d be perfect for a light satisfying breakfast. Cookbooks are my friends so I’m dying to check out the new Better Homes and Gardens Cookbook. Thank you for the heads up. Haha cookbooks are my friends too, I have way too many! These sound awesome! I love recipes like this—jam-packed with healthy tidbits. The best part is you can change things up by using different seeds and berries, so something like this never gets boring. I’m going to need to meal prep breakfast next week since we’ll be unpacking in our new home—I think this is my answer! Love this healthier version of a granola bar. YUM, plus wholesome ingredients. I’m in! I bet it would make a great topping for a fruit crisp as well. Wow what a great idea!! I love this for my toddler too to switch up her breakfast AND for all of the health benefits of the chia seeds! She will love the crunch in her yogurt. Thanks! This is perfect, I have been looking for variety in my healthy morning routine. I love the whole, clean food elements. Making this soon. I have a long week ahead. Thanks again for a great recipe. I need to put a ton of this onto my yogurt in the morning! These oat squares look perfect and look like the perfect addition to a daily morning routine. I’ll have to check the book out! These look so yummy! I’ve been trying to make my breakfast ahead of time, and I bet these would work perfectly for us. I love chia! Thanks Traci, straight from the oven they are just perfect! I remember my first copy of the Better Homes and Gardens Cookbook — from WAY BACK IN THE DAY and it had a ton of recipes that made me feel like I could really cook. This new one sounds au courant and another must-have. Speaking of must-haves, these coconut chia oat squares sound like a great breakfast or snack on-the-go. Healthy, crunchy and coconutty! This is my first one and I am amazed at how many recipes they can fit in one book, plus all the cooking tips and step-by-steps, it’s quite impressive! These look like crunchy little bites of goodness. Perfect as a topping to yogurt, or just to eat as a snack. I love making healthy treats for the grandkids. I will see if they like these.